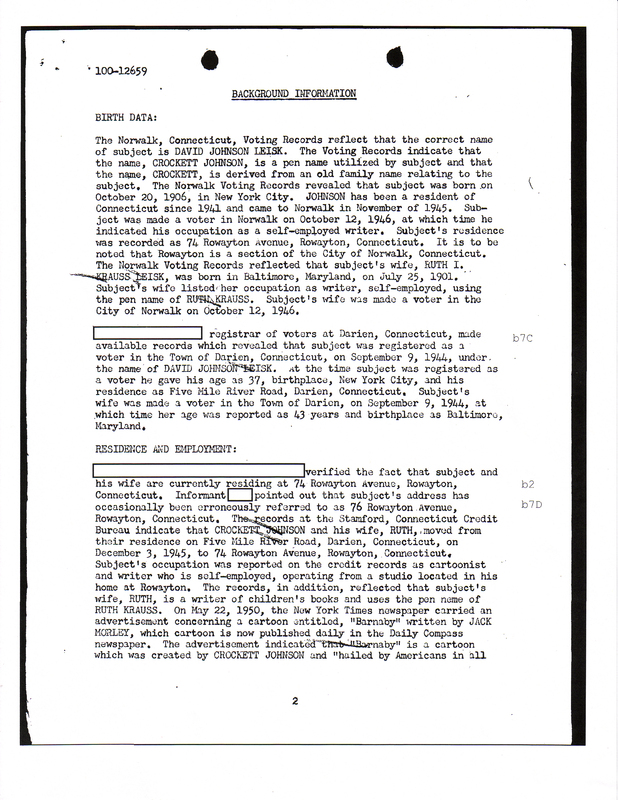 Crockett Johnson’s FBI File. Part 1. 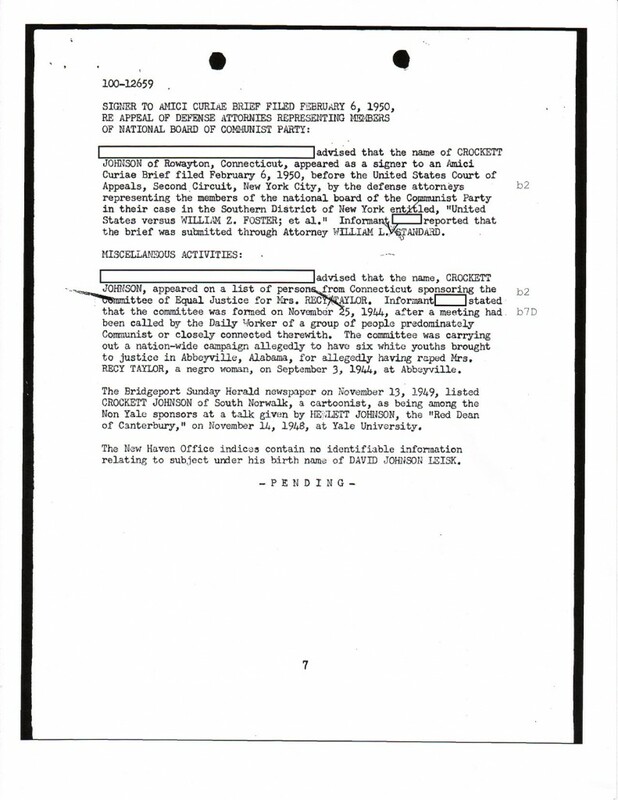 This (above) is one of the less accurate pages in the file. 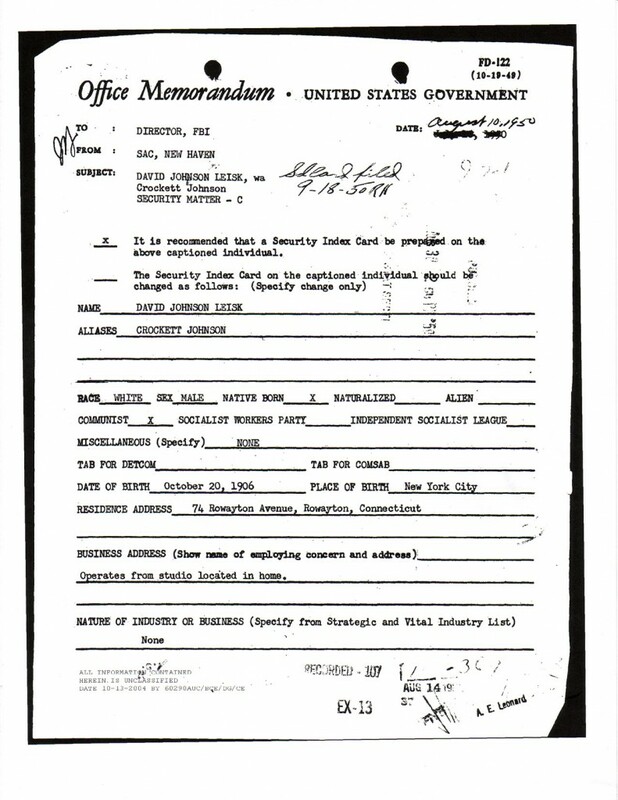 In 1950, Crockett Johnson was not a “concealed Communist” or even an open one. Also, Barnaby was never written by Jack Morley. At this point, Johnson was writing the scripts for Barnaby and providing rather detailed sketches to guide Morley’s art. 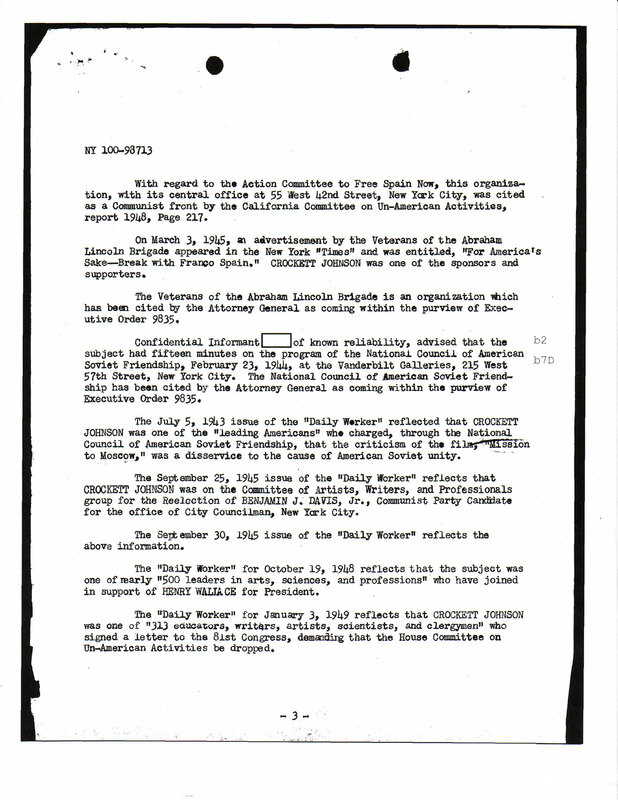 So, although the strip’s byline at this point read “Jack Morley and CJ,” it would have been more accurate to credit it to “Crockett Johnson and Jack Morley.” The page is correct, however, in identifying Ruth I. Krauss as his wife, and noting his association with the Independent Citizens’ Committee of the Arts, Sciences, and Professions (ICCASP). The claims on this page appear to be accurate. Johnson was a New Masses editor from 1936 to 1940, attended the Cultural and Scientific Conference for World Peace, supported the American Committee for Spanish Freedom. I don’t know whether the Jefferson School of Social Science considered him for a lecturer, but that strikes me as well within the range of possibility. In Johnson’s case, the FBI was very good at identifying organizations with which he was associated, but rather poor at gauging his loyalty to the country. I’ve verified most of the claims on this page, and the FBI is accurate. They fail to note (for example) that the American Committee for Spanish Freedom was supporting the democratically elected government of Spain against the Fascist usurpers — surely the sort of activity that the U.S. government should support. But it’s true that Johnson supported that group; the Win the Peace Conference; the Cultural and Scientific Conference for World Peace; and Benjamin Davis, a Communist who represented Harlem on the New York City Council from 1943 to 1949. Again, though their assumptions about his loyalty are off the mark, the FBI has correctly identified Johnson’s political affiliations. 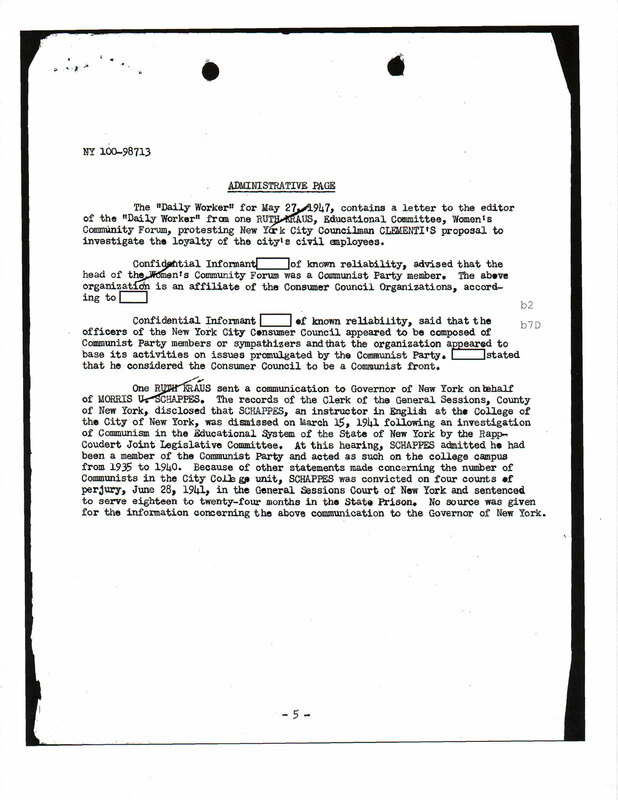 The Daily Worker issues mentioned do provide the information that the file alleges. The FBI here have done their homework, once more. Crockett Johnson not only attended William Gropper‘s 47th birthday party (Gropper’s papers, held by Syracuse University, verify that both he and Ruth Krauss were there), but — as noted above — art-edited the Communist weekly New Masses, 1936-1940. 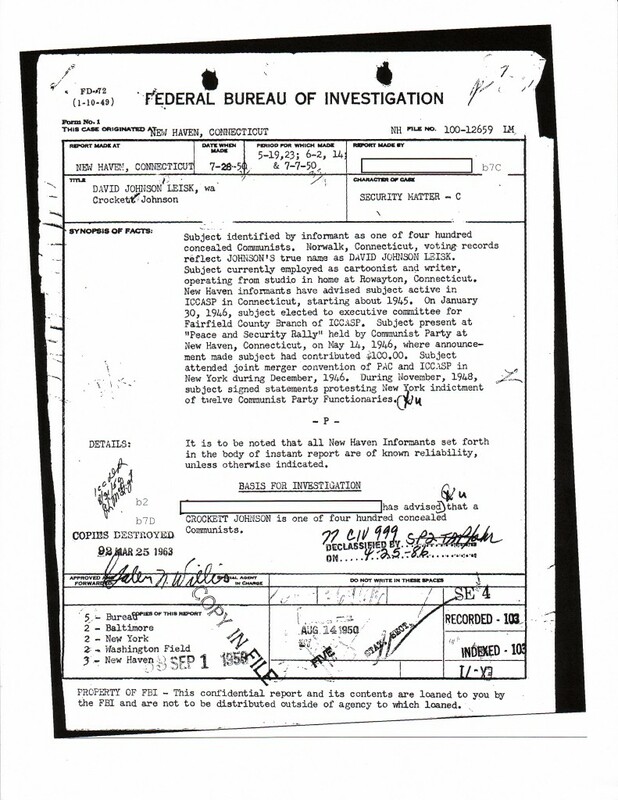 The FBI has here found an entirely different “Ruth Krauss.” This Ruth Kraus is not the Ruth Krauss married to Crockett Johnson. Oops. 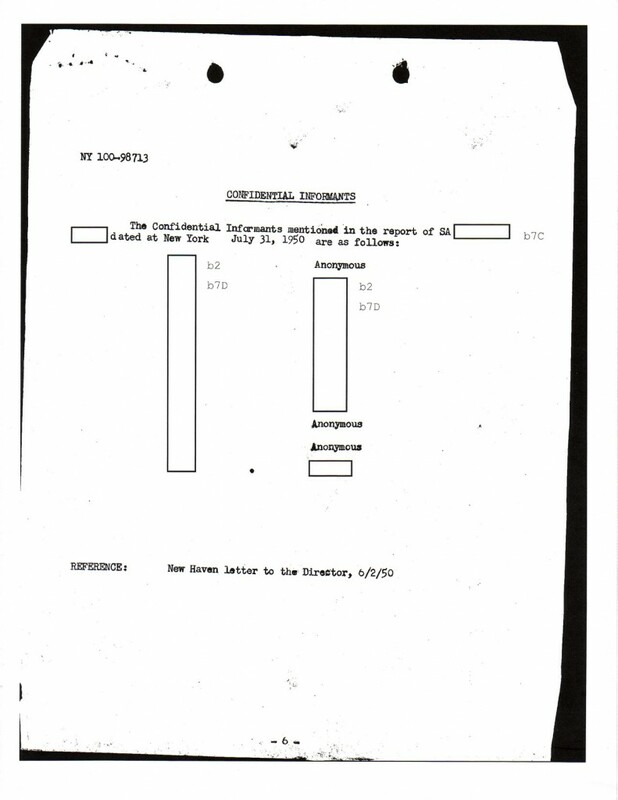 Informants’ names redacted. Not all pages in an FBI file contain interesting information. However, sometimes they forget to redact info. 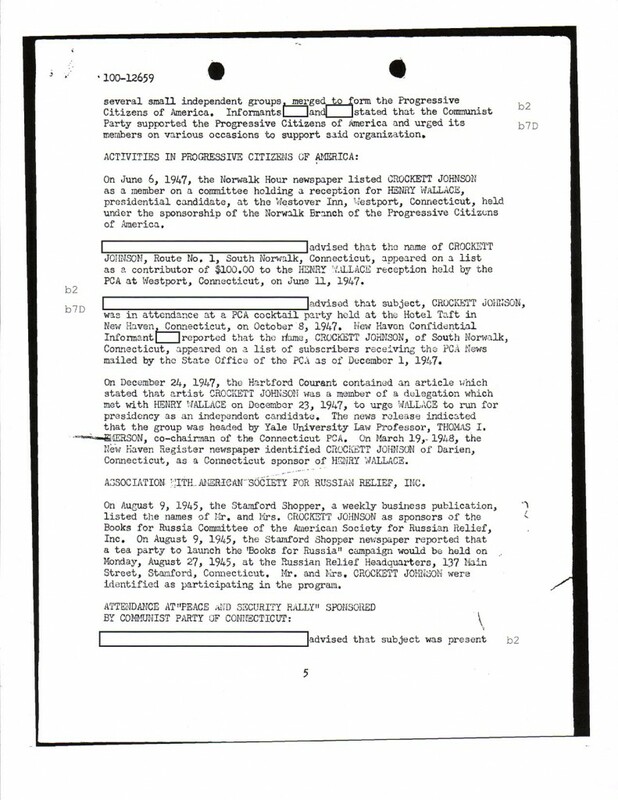 — a later page reveals that professional informant Louis Budenz was one of the people who supplied information impugning Johnson’s loyalty. Though Budenz was eventually discredited as unreliable, for a few years he made a good living as a government witness. Except for his party affiliation, this page (above) is accurate. I can’t verify the $100 donation, but everything else here checks out. Crockett “is derived from an old family name relating to the subject,” eh? That’s a new one on me, fellas. Also, Johnson moved to Connecticut in 1942, not 1941. But apart from those claims, the above info. appears to check out. I picture neatly dressed FBI agents surrounded by stacks of radical newsletters, busily compiling lists of alleged offenses. A rather dull job, but on this page, the G-Men have done fairly well. That said, I can’t verify each and every claim, and it’s worth noting that they’re doing a lot of “guilt by association.” Crockett Johnson and [name redacted] were both at an ICCASP meeting; [name redacted] was also active in the Norwalk Communist Party. 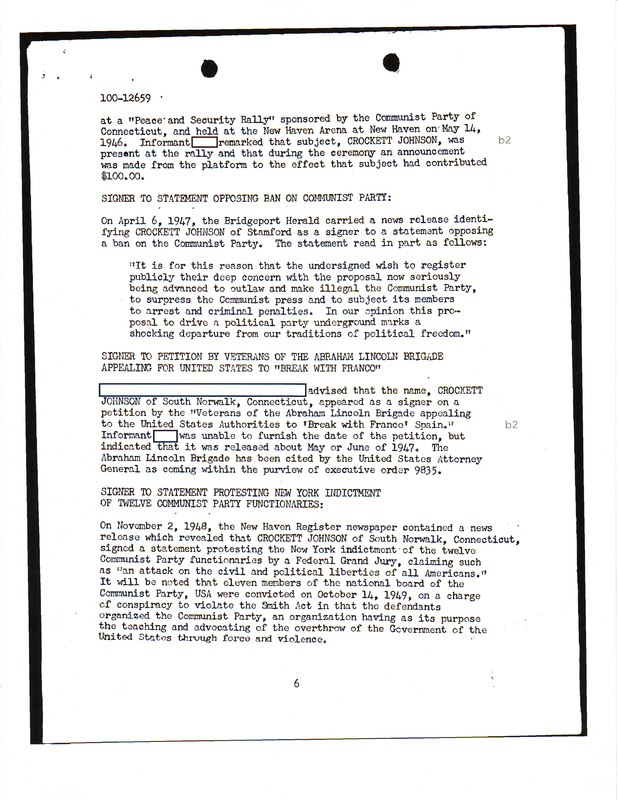 The suggestion, then, is that Crockett Johnson may have been also active in the Norwalk Branch of the CP. I have no evidence that he was, though he was definitely a member of the ICCASP, and I suspect that the FBI is correct in placing him at that meeting, and at other ICCASP events. As noted previously, the report of Johnson’s affiliations with ICCASP and “Win the Peace” are both accurate. Johnson did indeed support Henry Wallace and the PCA. He also appeared at the event for the American Society for Russian Relief. These items can be verified. However, as in many of the other items here, the FBI’s interpretation of Johnson’s affiliations is not as strong as their ability to uncover those affiliations (which is quite good). For example, the Equal Justice for Mrs. Recy Taylor Committee (below) was the inverse of the Scottsboro Boys trial: African-American woman (Taylor) raped, but white perpetrators get off scott free. Johnson’s support of equal justice under the law is laudatory, and should be read as such. 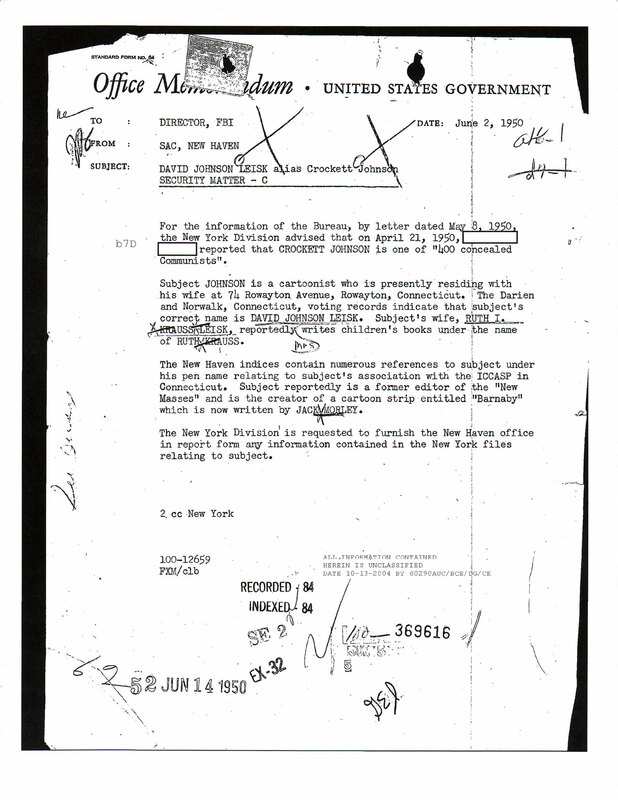 From the FBI’s point of view, Communists were in the forefront in their support of Civil Rights for African-Americans; so, in their eyes, Johnson’s support of justice for Mrs. Taylor reads as a “red” activity. 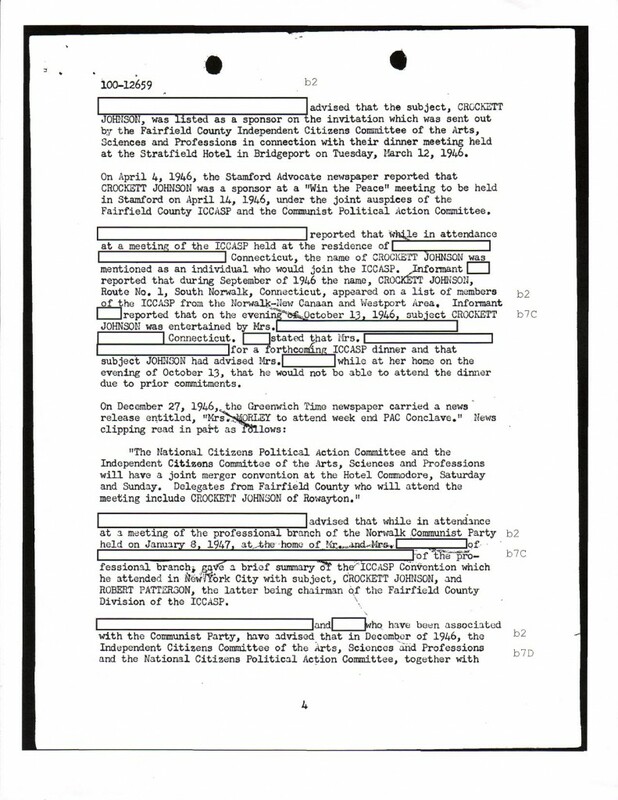 As you might expect, I have mixed feelings about “collaborating” with the FBI on my biography of Crockett Johnson and Ruth Krauss (coming this September). 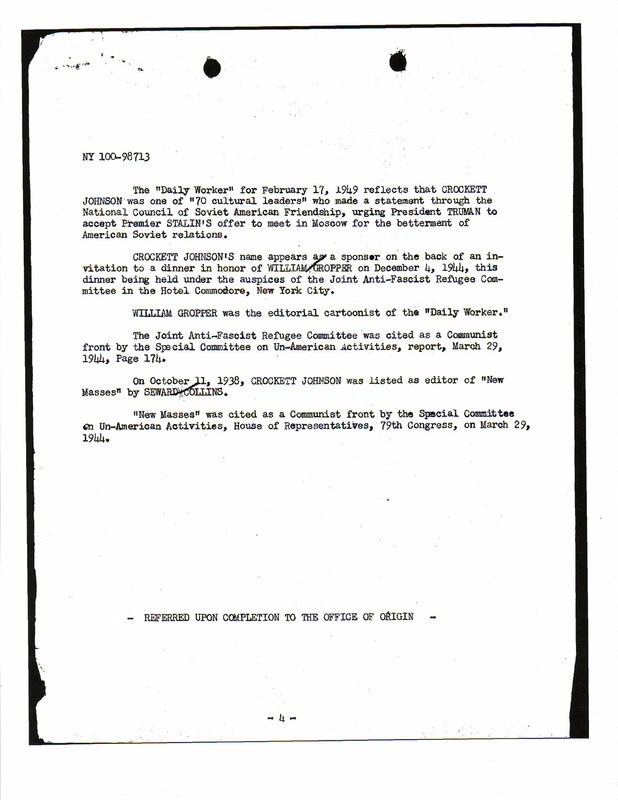 On the one hand, Crockett Johnson’s FBI file displays the dangers of unchecked power, and reminds us why the Patriot Act was and is a reckless idea. 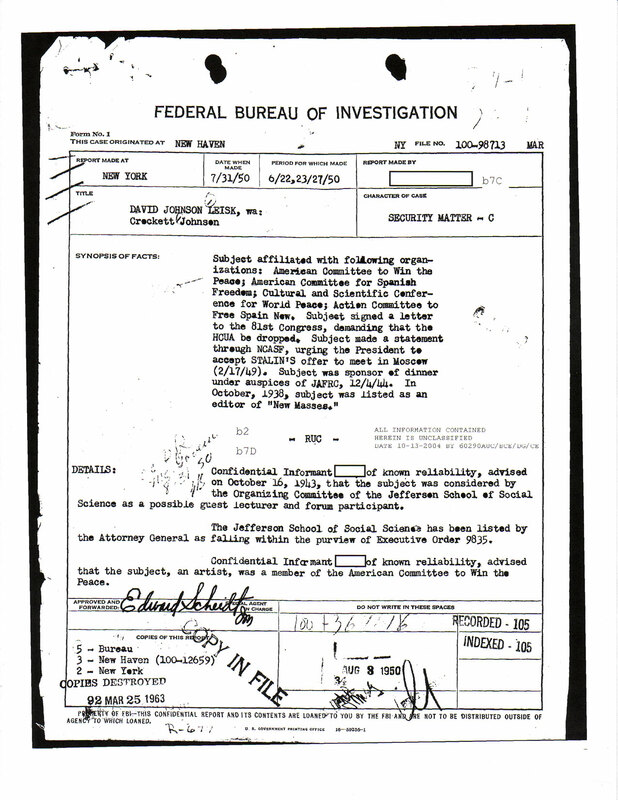 On the other hand, the file is a wonderful resource and I am grateful for the FBI’s assistance. 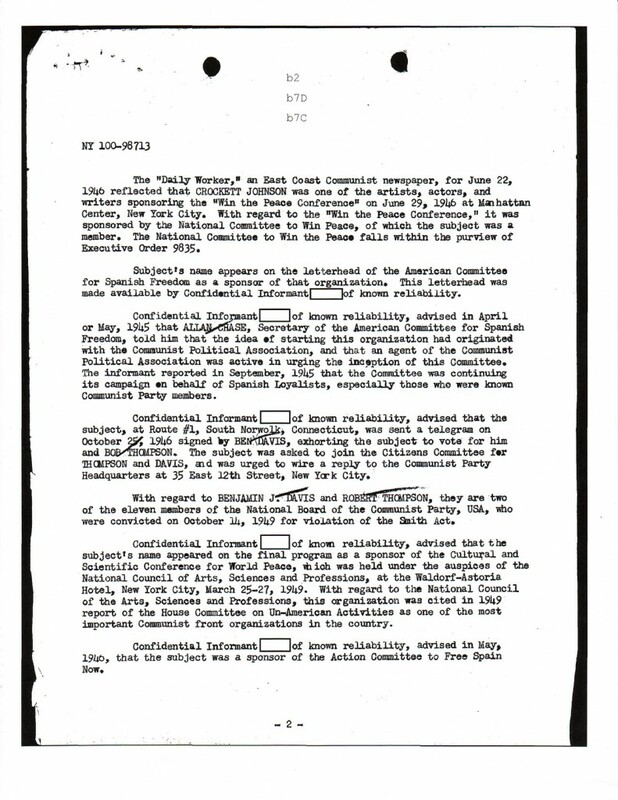 Though information in FBI files is not always reliable and their allegations about Johnson’s loyalty are false, their tracking of causes he supported is accurate. I verified everything I could, and the New Haven G-Men tailing Johnson did thorough work. 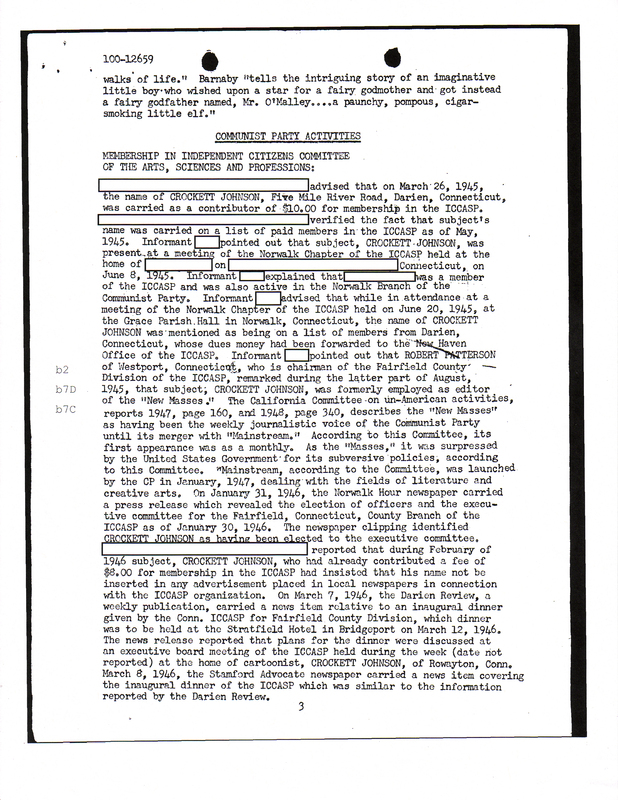 The entire file runs 114 pages — relatively small, as FBI files go. If I find the time, I may post other pages. Crockett Johnson and Ruth Krauss: How an Unlikely Couple Found Love, Dodged the FBI, and Transformed Children’s Literature will be published this fall by the the University Press of Mississippi.